I made a tiny zine about long songs - let me know if you want a copy! So far, 2017 is proving to be a good year for what we still call rock music. Part of the vitality of the form can be felt in two emerging trends I have observed starting earlier this year. 1. Live Albums: Rock has always thrived on stage and one of its central challenges has been capturing that lightning in the studio. A good live album bypasses that issue and gives us the raw, uncut power we seek (although sometimes with a little tweaking). As I noted in my review of the excellent and exploratory live album by Brazilian psych-rockers Boogarins, official concert releases haven't been so common lately. But even before that album came out, Sleater Kinney put out the explosive Live In Paris, which must have been manna for fans, as was Carrie & Lowell Live by Sufjan Stevens. Hiss Golden Messenger also put out a beautiful document of an early concert from their current tour. Get it for free - and if it doesn't compel you to by a ticket next time M.C. Taylor comes to town, I don't know what will. Perhaps this trend is a reaction to the bolted together industrial strength shiny objects that dominate the top 40. Either way, it's a heartening development and I think there will be more. 2. Epic Tracks: Long songs by rock bands is another trend that has ebbed and flowed ever since Dylan waxed Like A Rolling Stone and The Doors ended their debut with The End. While they've never gone away entirely, this was the first year that I've felt moved to start gathering songs longer than seven minutes in a Spotify playlist imaginatively called Epic Tracks 2017. Maybe it's the Blackstar effect, as the title track from Bowie's final album was a 10-minute masterpiece, or it could be inspiration from Car Seat Headrest, who turned heads in 2016 with The Ballad of Costa Concordia, which powered on for 11 minutes and change. When it came to starting up the playlist, more than one song from Father John Misty's astonishing Pure Comedy could have made the cut. Tough choice, but I picked the incantatory expanse of Leaving L.A., which devastates in one minute and causes a snarky chuckle in the next, to finish the mix. His old colleagues Fleet Foxes are also included, represented by First Of May/Ôdaigahara, the suite-like first single from their upcoming album. A less expected occupant is my cousin, Billy Joseph, with the title track to his lushly produced album Ride On The Mystery, which finds him pushing his voice into new places, before letting guitars and synths take over. I was also surprised - and most pleasantly - to hear Jay Som stretch out on For Light, the last song of Everybody Works, her striking collection of sophisticated indie - all recorded in her bedroom. She really can do it all. While lengthy songs are common in metal, Mastodon's latest, Emperor of Sand, is such a killer return to form that I dropped Jaguar God into the list. The Feelies have also been known to play long and, as it happens, my favorite song from their lethargic new album is In Between (Reprise), a blistering 11 minute rocker. LCD Soundsystem is another sacred cow that disappoints as often as it delights, but fortunately their new single is in the latter category and one song, Call the Police, is a natural fit for the playlist at just over seven minutes. Keep me in the loop on anything I've missed - I'm hoping the Epic Tracks 2017 playlist itself goes to epic length by the end of the year! In addition to the albums mentioned above, here are three other rock albums that I've been returning to often. The Courtneys - II This is a familiar sound: driving rhythms, guitars that chime, grind, and mesh, taut bass lines, edgy-sweet female vocals, a whiff of the 90's. Familiar enough, in fact, that I almost turned away. But then the hooks got their hooks into me, the band's conviction and craftsmanship became more convincing, and the lyrics revealed a sly commentary on the nostalgia the music seemed to represent: "You'll never get old and you'll never die/It just makes me want to cry." It's an addictive, joyful collection that improves on their debut in every way. No sophomore slump here! Start with Silver Velvet or Lost Boys (yes, an homage to the Kiefer Sutherland classic) to see if your boat gets afloat. 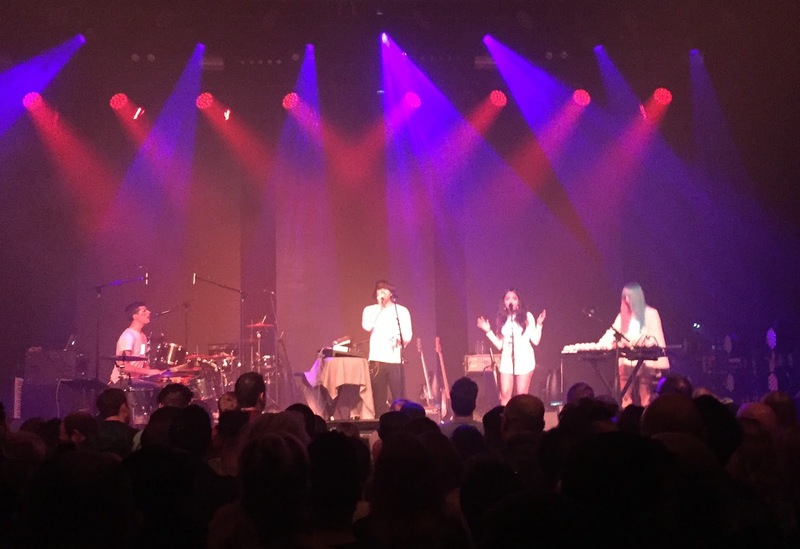 The Vancouver-based band is on an extensive world tour (sometimes as an opening act), which will be returning stateside in September. I wish I could see them at the High Watt in Nashville, but I will gladly settle for Park Church Co-op in Brooklyn on October 15th. Novella - Change Of State This is also a second album, although the Londoners have been honing their sound since 2010. All that hard work paid off in their distinctive debut, Land, which came out in 2015. So Novella's progress is more incremental than The Courtney's, but it shows in the greater focus they bring to their crystal-clear psych-rock, which starts with flowing melodies and marries shimmering guitars to a hypnotic beat that casts back to Klaus Dinger's motorik drumming in Krautrock pioneers Neu. First-timers should dial up the title track or A Thousand Feet, with its haunting refrain of "But there's nothing there," and a spacious arrangement that probably gives plenty of opportunities to stretch out in concert. Now if they would just play NYC...or at least make a live album. Spoon - Hot Thoughts By now an American institution, Spoon returned after three years with yet another terrific album, their ninth in a 20 year career. The production shows even more attention to detail than their last, They Want My Soul, which is saying a lot. Their ongoing fascination with techniques borrowed from hip hop and R&B continues to inject sonic excitement into the songs, which are already little wonders of jagged chord changes and jarring emotions. Dave Fridmann (known for his work with the Flaming Lips) is once again their able co-conspirator in the production chair, and I also note that main songwriter Britt Daniel is using co-writers outside of the band, which is unusual. I'm not sure if that is the source of the more telegraphic, minimalist style of some of the lyrics, or some other aspect of the songs. Another difference is that the core of the album was recorded as a quartet, without multi-instrumentalist Eric Harvey, who had been a member since 2004. This seems to expose the other players' contributions - in a good way, with Rob Pope shining especially bright on bass and adding a post-punk edge to keep things from getting too polished. Jim Eno is forever superb on the drums and newest member Alex Fischel continues to deploy intriguing keyboard textures while also being Daniel's sparring partner on guitar. These changes in personnel and process may be what it takes to keep things fresh this far into their career. While they have sometimes been accused of being formulaic, I can safely say that nothing else they've put out sounds like the nearly ambient Pink Up, which could almost be from side two of Bowie's Low, or Us, a melancholy instrumental laced with spacey sax (by Ted Taforo) that transports me to the futuristic L.A. of Ridley Scott's Blade Runner. It's an adventurous ending and one that points in new directions. Like rock music itself, Spoon continues to be surprisingly durable and rewarding - long may they reign. P.S. If the music described herein is in your sweet spot, follow my Rock, Folk, Etc. playlist on Spotify to hear more and keep up with new releases. "Both those who love 4'33"and those who hate it probably agree there's something provocative about it," composer David Lang (co-founder of Bang On A Can) told the audience at MoMA, referring to John Cage's most notorious piece. He's certainly right, and as I don't mind being provoked by art, I am firmly in the "love" camp. Another point he made was that Cage created the piece for avant-garde piano virtuoso David Tudor, which gave the unheard music far greater potential than if just anyone had sat down at the Steinway for four minutes and change. This was the perfect introduction to the performance by another virtuoso, violinist Todd Reynolds, which was part of a two night series focusing on music related to the Robert Rauschenberg retrospective at the museum. Reynolds did a remarkable job, striking a different pose for each of the work's three movements, dignified at all times but not without a puckish wit. I was put in mind of how someone like David Bowie could create unheard music in a still picture, like the unusual Hollywood-style portrait he had made for the Sound + Vision retrospective in the early 90's. It was not only a new look for Bowie, but it also seemed to refer to songs yet unwritten. Todd Reynolds, surrounded by the "silence" of 4'33"
Of course Cage, with his acknowledgement of the role of chance in his compositions, meant for us to pay attention to the sounds we do hear during 4'33", as no space is perfectly silent. In Titus Theater 1, two stories below West 53rd Street, there was plenty of listening to do. The periodic rumble of the subway was a lead "instrument," underpinned by the buzz of some electronics or lighting behind and to my left. There was a brief chorus of voices outside one of the fire exits, and the rhythm of my heart, which sped up for some reason during the first movement. It's not always easy to be in the moment, I guess. One brilliant way Cage dealt with that anxiety was to make it perfectly clear how long the piece will be. It went by surprisingly quickly, an appropriate appetizer for what was to follow. First up was After David Tudor (Homage To Fluorescent Sound), a tribute by Lang and Jody Elff to Tudor's composition for fluorescent lights, which can never be performed again. As Lang explained, not only is there no audio, video, or score, fluorescent lights have seen some improvements since 1964 and no longer make the humming and clicking sounds Tudor was amplifying. What they came up with was an assortment of fluorescent light fixtures, artfully arranged on the stage, and activated by Lang and Elff from a central console. Buzzing sounds of slightly different timbres began and ended, lights went on and off, my retinas got a workout. Sonically it had a slightly retro feel, which was appropriate, although I may have been the only one going all the way back to Franz Waxman's 1935 score for The Bride of Frankenstein, which featured some interesting "electricity" effects. It was a little unclear whether Lang and Elff were improvising or following some kind of plan, but there was a sense of build-up and finale as the piece came to a close. All told, it was a fun and affectionate acknowledgment of Tudor's pioneering work. Cage's Atlas Eclipticalis (1961), which "translates star charts into musical instructions," was up next and began without pause. Members of The New School's Ensemble 4'33", making their performing debut under Reynolds' direction, were arrayed around the perimeter of the room, giving us an immersive experience. The music, as fragmented as a pulverized mosaic, was made all the more satisfying for being the most melodic thing we had heard all night, even if the lights continued to buzz throughout. The human ear seeks to organize sound, first by assigning a direction and source (bassoon at 3:00! ), and then structure. There was none of the latter that I could discern until I realized that the atomization is the structure and relaxed into the randomness. Taken that way, Cage's conception is flawless and the performance could not have been better. The subtlety of some of the sounds, whether from electric guitar, percussion, cello or trumpet, was astonishing and quietly moving as the players coaxed it from their instruments. There is a great deal of flexibility in how this work is performed, and some recordings (James Levine, I'm looking at you) seem to conventionalize the music. I think I prefer Ensemble 4'33"'s approach, which seems somehow truer to Cage. I'm also sure I would hear more in a repeat performance, but I don't think it's in the stars. You can watch the first night of the series, featuring music of Morton Feldman, Bryce Dessner, and others, here. The Rauschenberg show continues through September 17, 2017. I don't know when I started reading credits. Perhaps it was when I was 11 and got Revolver by The Beatles for my birthday. "Tabla - Anil Bhagwat," it said under Love You To, a combination of syllables that was mysterious at the time and that has stuck in my mind to this day. Similarly, when searching for clues in the tiny type of the booklet for Tricky's Maxinquaye, I came across the name Alison Goldfrapp. It was not only a name that was impossible to forget, but her performance on the spectral blues of Pumpkin was equally so. That's why I keep reading the credits: It puts my antenna up for what's next. So I was already hailing a ride to get on the sleek train that was Felt Mountain, Goldfrapp's debut from 2000, made with her partner in cyber-crime, Will Gregory. I don't think they get enough credit for delivering one of the most perfectly formed first albums of recent decades. Mixing the glam stomp of T.Rex and Bowie (yes, Gary Glitter, too), a melodic inventiveness that could be described as Mozartian, and updates on the electronic adventures of Kraftwerk and Giorgio Moroder made for a winning combination. Goldfrapp's voice was a wonder from the start, and wonderfully human, the flesh on Gregory's chrome-plated bones. That humanity was often expressed in a mature sexuality that was frank and unattached to prosaic pop love songs. The hint of dissonant Weimar cabaret only amplified the mood, although that element has retreated on subsequent releases. Even so, Black Cherry and Supernature, albums two and three, only ramped up Goldfrapp's pleasure centers, with songs like Strict Machine and Ooh La La taking on an unstoppable momentum - in England, anyway. They didn't make a dent commercially this side of the pond, but it made perfect sense to me when I was flipping the channels and came across them on VH1 playing to a football field of Britons (maybe it was Glastonbury), all of whom were feeling the spirit. No doubt that was partially due to Goldfrapp's sheer star power: it was the first time I saw her stagecraft, which is simple yet extremely effective, as she rides the binary of dancing vs. theatrical movement. That split is a fair representation of the way the mechanical, analytical side of their music is put in service of physical propulsion. The fourth album, Seventh Tree from 2007, seemed like more of a left turn at the time than it does now. The occasional acoustic instruments (and Goldfrapp's pastoral Napoleonic cosplay on the cover) gave the impression of a folk makeover for the duo. But Gregory's musical sophistication led to these new sonic elements being put in service of their vision, rather than vice versa. In short, it was just as addictive as prior albums, if a little more inward-facing, with songs like A&E becoming canon in short order. Then they took a break. Gregory has a wide variety of extra-curricular pursuits, arranging and composing for soundtracks, etc., so perhaps that slowed them down. Or it could have been personal matters, but they both keep their private lives private. There was some pushback against Seventh Tree from critics and fans, but I can't imagine supreme artists like Goldfrapp being affected by such things. Either way, when they returned with Head First in 2010, it was my turn to be disappointed. Inspired by Euro-disco - a genre that may appeal more to those in proximity to, or in residence on, the continent - it sounded rather thin. "Where's the whomp?" was the question I posed to the world via Twitter. Except for Shiny & Warm (the title could be their mission statement), which was a perky take on their signature sound, I never fell for Head First. Besides two songs on The Singles, there was no new music until 2014, when they released Tales Of Us, which truly was a left turn. With delicate chamber arrangements by Gregory, no electronics to speak of, and Goldfrapp's most personal lyrics yet, many hailed it as a triumph. While I wanted to love it, I found it to be exquisite but surprisingly inert, at least until nearly the end when Stranger swoops in on soaring strings to rescue the album. Call me a philistine, but I just don't think gravitas is the only way to display artistic development. I'm not saying that Goldfrapp is only allowed to make kicky and hypnotic electro-dance-pop - it's just that they're so good at it! Now, three years later, they've returned to form with Silver Eye. From the opening one-two of Anymore and Systemagic, both featuring elemental riffs played on analog synths and irresistible mid-tempo dance beats, to the tripped out finale of Ocean, there is not one wasted note or gratuitous effect. It's been twenty years since that Tricky album and Goldfrapp's voice shows no signs of time's ill effects. But it's not as though they haven't continued to develop - deeper cuts like Zodiac Black and Faux Suede Drifter display elements of dub and a new sense of effortlessness that brings to mind the Italian cosmic prog of Sensation's Fix. The rhythms are sometimes even more intricately mesmerizing, with less reliance on four-on-the-floor grooves than before. The time was right for them to come back and take their place amongst their many children like FKA Twigs, Py, Novelty Daughter, Tei Shi, and Grimes. I was quickly addicted to Silver Eye and when a two-night stand at Brooklyn Steel was announced I counted myself lucky to get a ticket for the Wednesday as the Thursday sold out almost instantaneously. Having recently been to the King's Theater and National Sawdust, I was also excited about taking a a look at this new venture from Bowery Presents, the last on my list of recently opened venues to check out. Located near the Graham Avenue station of the L, Brooklyn Steel seems to be just ahead of the curve of deeper Greenpoint becoming a more familiar destination. Even so, I was able to find a hip spot for dinner, Humboldt & Jackson, located on the corner of the same name. Good food, a great whiskey selection (Elk Rider Rye where have you been all my life? ), and a warm room with nice service made for a fine pre-concert experience, marred only by a wretched playlist of Eighties pap that managed to include some of my least favorite songs. File under: Trends to end. Brooklyn Steel was only a few blocks further and was, no surprise, a repurposed factory building. ID was checked on the sidewalk and the security checkpoint was just inside the doors of the enormous vestibule. While they didn't scan my belongings, I was required to remove everything from my pockets and put it all in a plastic dish before walking through the scanner myself. I'm glad I got there early! I presented my ticket on my phone, the barcode was read, and I was finally all the way in. The double-height lobby still had that "new car smell," which may have been partly due to the mist spilling out from performance space. It also had the expected look of what we used to call "industrial chic" in the 70's, but it wasn't overdone. There was a solidly curated bar on the left and a merchandise area on the right, which currently only had small Goldfrapp posters on display, alongside some CD's and vinyl brought by Corbu, the opening band. The posters were nice enough for $10 but would only be available after the show. I planned to check back then to see what else was on offer. There was still time to explore so I climbed the stairs to the mezzanine level. I noted a door to the VIP room, guarded by a man and a combination lock, before continuing onto the balcony. There was another bar on the wall opposite the stage, which was a longer throw than I would have liked from the balcony railing. This was exacerbated by a dead center VIP section which put the beautiful people eight or ten feet closer. I don't know the measurements but it felt further than the one at Terminal 5, which holds 3,000 to Steel's 1,800. Even so, there were already clumps of people staking their claim, either sitting on the floor or leaning against the railing. The VIP was empty. I ordered a Bulliet Rye from the bartender who, like everyone else who worked there, was completely professional and very nice, leading me to wonder if Danny Meyer is a silent partner in Bowery Presents. Either way, somebody there cares about hospitality. I wanted to be closer to the action so I went downstairs to the floor, which was only about a quarter full. I noted another bar on the back wall and went to find a spot to await the opening act. I had listened to Corbu's debut album, Crayon Soul, and found some of it to be surprisingly sophisticated and engaging, but there were also a number of tracks that felt unfocused or even generic. Still, there was something to Corbu and I was curious to see and hear how they would do on stage. The five members took the stage in matching outfits, each featuring a luminescent panel and evincing a late-sixties futurism. For their first time on a big stage they acquitted themselves fairly well, cheerfully going through their set despite the chattering audience. I can't say I was riveted but I think they made some new fans. If they're going on the whole tour with Goldfrapp, it could be a whole other story by the last night on the road. Either way, I'll be keeping an ear out for them in the future. 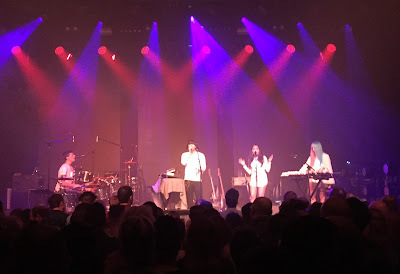 After Corbu's short set their gear was broken down quickly, the lights got darker, a huge puff of purple smoke emitted from the stage, and the crowd in the now packed room pushed toward the stage, murmuring in anticipation. Cheers went up for the musicians, clad all in black and looking serious, as they took their places, and then a huge roar went up as Allison Goldfrapp emerged and moved toward the microphone. She looked fantastic, with her hair still dyed ruby red as it is on the cover of Silver Eye and wearing an ensemble that would have been merely stylish had it not been made of reflective silver fabric. She greeted the crowd and seemed genuinely moved by the long ovation. They started the set with Utopia and took us there, musically speaking. She was in great voice and the configuration of two keyboard players, a bassist and a drummer was ideal for Goldfrapp's sound world. Lovely Head was next and I suddenly thought: this woman probably sings coloratura in the shower - she sounded that good. The crowd was into it, but many people were more concerned with recording and observing than losing themselves in the music. Don't get me wrong - I took pictures, too, but tried to be strategic about it and put my phone away for most of the time. I wanted to dance, to let those crushingly inevitable beats move me as intended, and to be transfixed. Goldfrapp were more than holding their end up and I wanted to do my part to participate. As they went through their set, Goldfrapp's command of the stage only grew more impressive and I felt like I was in a shamanic presence and was ready to follow her wherever she led. Anymore and Systemagic both more than held their own among classics like Train, Ride A White Horse, and others, as did other songs from Silver Eye. Even Dreaming from Head First sounded great, as did Shiny And Warm, played during the encore. The sound system throughout was excellent, highly detailed and not too loud although there was power to spare. There was a moment when the keyboard players switched to Keytars and momentarily flummoxed the audio, but the signature squelch of those once forgotten instruments was worth the glitch. As they went through what flowed like an expertly organized playlist, I noted that there was an interesting divide between the four musicians, one which pointed up the combination of the sensual and the mechanical in Goldfrapp's music. The keyboard player on my left and the drummer were both grooving hard, the one leaning into her bank of synths, head nodding, and the other sinking into his rhythms with the relish of a hungry man at a feast of his favorite foods. On my right, the keyboard player stood tall at her rig, executing her parts with an almost clinical detachment while the bass player was all stoic perfection. And Allison Goldfrapp stood in the middle, a locus for all these approaches and attitudes, moving with the ease of a natural star. I don't know if this split was calculated but it worked for me, blending with the brilliant lighting and the intriguing projections to make a real show. Brooklyn Steel proved to be a great new mid-size option for concerts, although Bowery Presents might want to work on the AC. "Are you hot or is it just me?" Goldfrapp asked on more than one occasion. It wasn't just her - it was sweltering by midway through the set and did not improve. Also, I'm not sure if Goldfrapp has an excessively tall fan base or if the stage is not quite the right height. All I can say is that I'm 6'1" and felt like I was straining to see the band from about 10 rows back. I don't remember having the same experience at Bowery Ballroom. The generous set, followed by a generous encore ending with an ecstatic Strict Machine, had me floating out of the room towards the exit and cool night air. A quick check of the merch booth revealed nothing more than those posters - no vinyl, CD's or t-shirts - so I kept moving, happy to note that Corbu were holding court with friends. All the way home, I basked in the glow of having seen one of the true masters of the stage. I don't know where Will Gregory was that night but he missed a hell of a concert - don't make the same mistake when Goldfrapp hits your town.